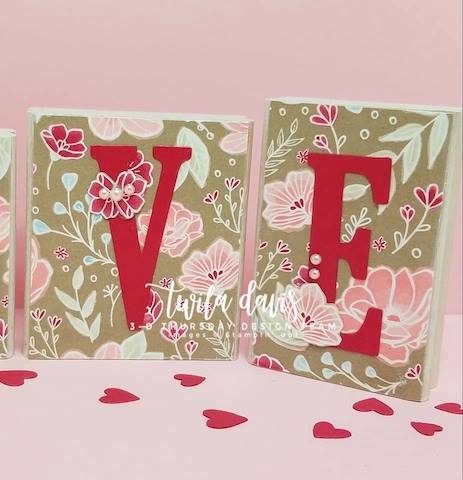 3D Home Decor to add the LOVE! Good Morning and today….LOVE is in the air! This week it is Twila Davis from Stamp a Little Longer time to do a fun 3D project and she was rocked it with a beauty that you can pull out year aver year to enjoy! At the end of this post you will find a link to the FREE Project Sheet that has step by step instructions & color photos so that you can create your own beautiful project. I bet if you are like me….than you have some wooden blocks around and I say – put them to use as after all, it is fun to figure out how to repurpose something that we have taking up room! 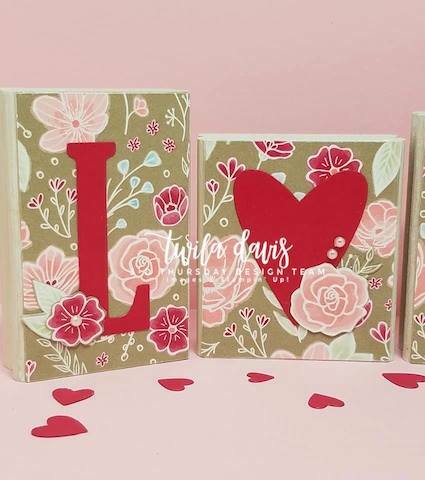 The blocks have been” – jazzed up a bit” with the beautiful DSP from the Occasions Catalog, All My Love. 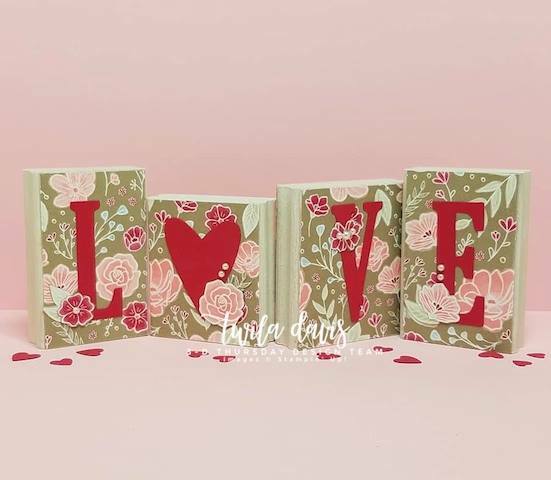 This is a beautiful collection of paper that I would not shy away from it at all….as then the flip sides of the paper that has hearts (that might make you think more of Valentines Day) have amazing and oh so detailed floral paper that are beautiful! The letters are die cut using Large Letters Framelits dies from Lovely Lipstick cardstock and that heart is cut using a die from Be Mine Stitched Framelits Dies…here is a tip…if you do not have the letter dies, just find a similar font on the computer…..enlarge the font size and print it off and then you can trace it onto a piece of cardstock so you can fussy cut it out! As the saying goes…where there is a will…there is a way! 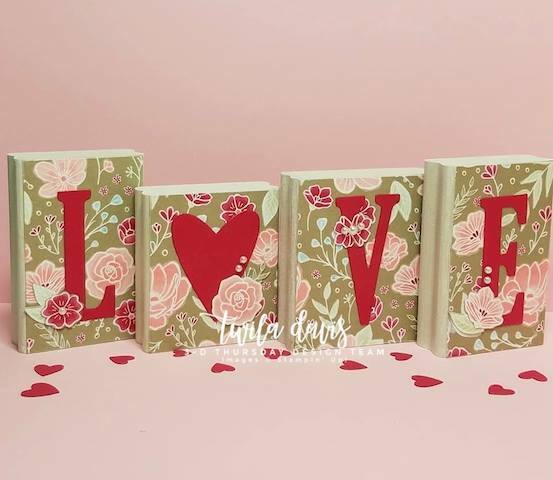 I also love the way that Twila used different heights of wood blocks as it adds interest! I have been on FULL THROTTLE MODE in making Valentines….treats and such for my peeps and also my friends peeps. I know that everyone is all grown up but I know how I feel when I get a little sunshine in my mailbox! Valentines was one of my favorite times of the year when I was a grasshopper….I just loved to see the Valentines I received from classmates – darn, I hope that they still do that in schools as it was just the best! 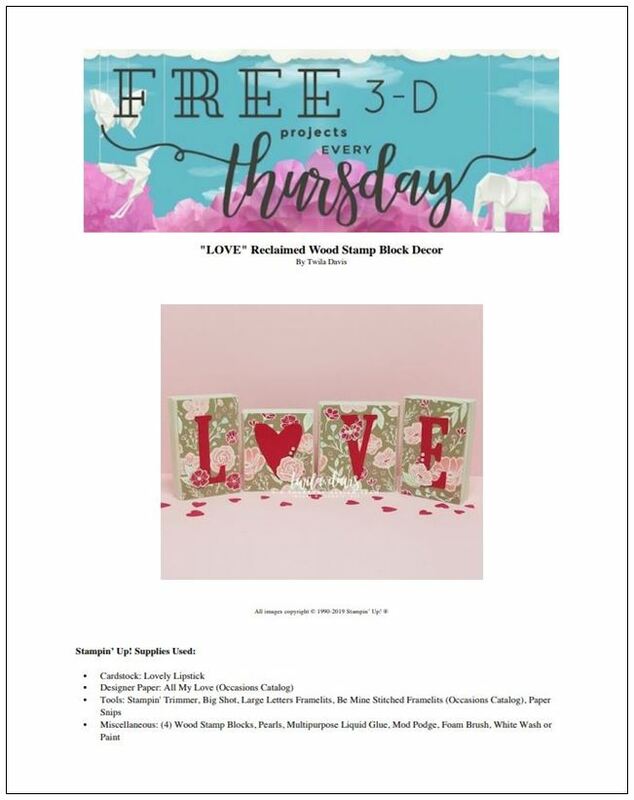 Here is one last peek of Twila’s fun project….how about adding some “LOVE” to your home with this fun project….. CLICK HERE to see and download the FREE PDF to give you the full scoop!!!! Have a great weekend….and add LOTS of love into your life…your heart….and makes someone SMILE!!! Twila’s project is very sweet and will be easy to CASE. Thanks, Susan, for sharing it today.Enjoy your day! Oh what a great idea. Easy, looks great and simple to keep from year to year. I just paired down my Valentine decorations and this would be a great new, fresh idea to have. Hi Susan, This is just such a cool idea! Thanks for Twila, for thinking of it, and to you, for sharing! Off to yoga now–you have a great day, OK? I love this project. I have seen other words done this way. Yep, I have lots of blocks as I didn’t always mount my stamps. Since I didn’t have the letter dies I was just unsure what to do. Duh moment, thanks for the tip using the computer. I have some favorite papers that will get some use now. Right now I could see spelling SNOW with a snowflake or snowman on it. SPRING with flowers would be a fun decoration. Wouldn’t it be fun to spell WINTER using all the fun plaids we had? Oh, I can see my mind will be racing with ideas! Very clever idea! Great way to use those blocks. Thanks for sharing Susan. I like your variety of ideas, Chris. How beautiful!! What a great idea.